Yes, we’re going to Japan! It’s been over 10 years for me and first time for Life-Partner-In-Crime. Quick backgrounder: I’m a first gen Japanese immigrant and while my parents and I immigrated together to Canada, they went back once I left the nest. Due to a bunch of circumstances which ended up being more challenged once I decided to be self-employed, the time stretched into a decade since I’ve last visited. So probably like most people, there are some things I missed. What I’ve missed most importantly are my parents. And most recently, I’ve literally missed my father, who passed away recently. Not everyone has good relationships with family for all sorts of reasons. In my case, I’m thankful that my parents were committed to being the best parents they could be to me and as a result, we have been close our entire lives. But you can imagine that trying to maintain relationships with people on the other side of the globe has it’s challenges. THANK GOD FOR THE INTERWEBS. We’ve been working toward making this trip happen for a while and it’s official… well, almost official since we’ll be purchasing our airfare soon. However, the dates are set for later this fall. In the meantime, I’m so excited about all the planning, I’m having trouble sleeping!! There’s a ton I’m learning through all the research I’m doing, so I decided to share as much of what I’m finding out here so that maybe it can be helpful for others, too! Sharla is a fellow Canadian woman who lives and works in Japan and has one of the more prominent YouTube channels about Japanese culture and living in Japan. Chris moved to Japan from the UK to teach English and documented his experiences from his perspective on YouTube. Thanks to his humor, wit, quickness and clever videos, he has become another popular Japanese YouTuber and appears to now be making videos full-time. Another fellow Canadian, Kate, unlike the previous two YouTubers, doesn’t live in Japan. But Kate and her partner recently went to Japan and the video above and her trip vlog was really informative. If you haven’t already, check out and subscribe to all the channels above for regular doses of Japanese goodness. As I mentioned above, I’m self-employed, and so is my partner. While working for ourselves provides us with great flexibility and we’re both extremely fortunate to be able to do so, if we’re not working, we’re not making money. Which truthfully, can be quite scary. It’s one of the big reasons why this trip has been difficult to make happen up to this point. So that we can do this trip together, we have also decided to start a fundraising campaign where we’re offering some fun gifts to help supplement our trip. We’re also working toward moving my mother back from Japan to live with us in Canada, too. If you enjoyed this post or would like to help us out while also getting something fun out of it, please visit our fundraising page (ooops, not yet set up)! 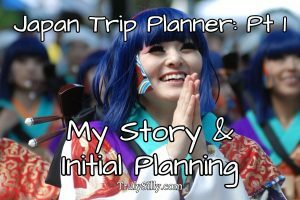 And stay tuned for more posts about trip planning to Japan!